Koriand'r was born into the royal family of the beautiful, tropical planet of Tamaran as the middle child of Myand'r and Luand'r. She was named heir to the throne over her sister, Komand'r, who was born with a genetic defect that robbed her of the ability to fly. This made her an outcast among her own people, who treated her with great disdain and felt her inferior to the rest of them. Koriand'r on the other hand was showered with affection, affection that her sister felt she deserved. This embittered her toward her sibling, something that went beyond a simple rivalry and grew into a deep hatred over the years. However, despite this, Koriand'r disapproved of the way her sister was treated, feeling it unfair. She often tried to be friendly toward Komand'r, but only to be rejected each time. This only served to put even more distance between them. Things only got worse when the siblings were sent off for combat training with the Warlords of Okaara. Koriand'r saw this as an opportunity to perhaps bond with her sister, sometime to be alone and get to know each other. Unfortunately, Komand'r simply saw this as an opportunity to prove she was better than her sister and as a chance to embarrass her. As the training went on she only became more intense, especially so when her sister did anything better than her. Koriand'r only saw this as her sibling being competitive, and it only made her try harder. One day, during a particularly tense sparring exercise, Komand'r finally let all her bitter emotions spill out and she viciously attacked her sister and would have killed her if not for the intervention of the warlords. For her attempted murder, Komand'r was exiled and told never to return. This was not the last time Koriand'r would see her sister though. It would be years before anyone would see or even hear of Komand'r again. It was anything but a joyous reunion when she returned, the entirety of the Citadel with her, still set on the hatred of the sibling she so wrongly accused as the cause of her suffering. The eldest daughter of the royal family had returned with the same skewed view, and wanted nothing but revenge on everyone who shunned her and made her feel inferior. Though the Tamaraneans had defeated or fended off their sworn enemies for so many years, this time it was different. They struck at specific weak points in Tamaran's defenses, as if they had detailed information of them, causing mass confusion that aided in their swift victory. Oddly enough, they offered to spare the planet in exchange for only one thing, Koriand'r. Feeling they had no choice, and couldn't possibly sacrifice Tamaran, Myand'r and Luand'r exchanged their daughter for its safety. Koriand'r was horrified at this thought and fruitlessly fought as she was dragged away from her home. She didn't understand how her parents could just give her up like that, without resistance or protest. The greatest shock came when she met her new master, her sister, Komand'r. She had told the Citadel how to conquer Tamaran and personally requested Koriand'r as her slave as well. She was not satisfied with just this however, feeling her sister had not suffered nearly enough. The longest years of Koriand'r's life began that day, over six years of horrific torture and humiliating servitude. For every mistake she made or each time she spoke out of turn, no matter how insignificant or brief, she was brutally beaten. Even when she performed her duties without error or protest she was undeservedly beaten as well, as if her simple prescence was enough to permit it. One day, fed up with being mistreated so awfully, Koriand'r killed one of her slavers in a blind rage. She was dragged to Komand'r, who mocked her about 'not knowing her place', and ordered her execution as the punishment. All seemed hopeless to Koriand'r as she was led away, but at that moment the ship she was on shook violently, knocking her and her guard over. The shaking quickly became more frequent and the lights been flickering on and off. Alerts rang throughout the vessel, ones that told the crew that they were under attack. However, even with the alerts, the assault was so quick and overwhelming that the ship was taken over with ease. The attackers were known as the Psions and came for only for two things, Koriand'r and Komand'r. The sadistic scientists were only interested in studying them as projects and, to the younger sibling, her years of servitude felt like a blessing compared to their experiments. They had actually been hunting Tamaraneans because of the interest in their unique physiology. Their experiments horribly stressed their ability to absorb solar radiation, pushing them to their uppermost limits, to the point where they were trying to gauge how much their bodies could take before being ripped apart. Both sisters had to endure this process time and again over the course of weeks, proving incredibly resilient. Komand'r's allies soon found the Psions and attacked in an attempt to save the elder sister. With this distraction, Koriand'r felt this might be the only chance she would get to break free and struggled against her restraints with all her strength. At that moment, a bright, destructive light enveloped the room she was in. When she opened her eyes she found everything around her in ruins, her hands eerily glowing. She was finally free. Koriand'r got ready to leave but found herself hesitating. Despite all Komand'r had done, her crimes against Tamaran and brutal torture over the years by her order, the princess still couldn't simply abandon her sister. She raced to where she was held and freed her against her better judgment. Even with this act of mercy, Komand'r only saw it as her sister looking down on her again and couldn't let go of her hatred. She attacked her sister with a blast of the same energy Koriand'r had used to escape her restraints, and was now somehow able to fly as well. Finally accepting that the relationship with her sister could never be mended, Koriand'r fended her off and jumped into the nearest escape pod. She didn't care where she was going, as long as it was anywhere away from all of this. The pod disappeared into deep space, hurtling toward a planet completely foreign to its sleeping passenger. Earth. Koriand'r is a very passionate and emotional person, just as the majority of her people, the Tamaraneans, are. She is confident and outspoken, believing that one should openly express themselves and be unapologetic in doing so. Battle is a sacred thing to her people and she was taught from a very early age to be a fierce and no-nonsense combatant. She has no qualms about engaging another in a fight, and always strives for victory. Of course, this does not mean she is barbaric in this regard, as she would not usually go as far as to lose sight of more important priorities, such as innocent people or ones she cares for. Despite her years of slavery, Koriand'r is actually quite the optimistic person and someone who greatly values nature and life as precious things. Most importantly she values freedom, since it was taken away from her for so long. Overall, Koriand'r is kind, incredibly loyal, loving and a good person that likes to enjoy life and help make sure the people around her can as well. Starfire wishes to find peace away from her oppressive world. However, this being said, she wishes to become powerful and skilled enough to eventually return and lay the smackdown on her sister. She is motivated by experience. She wishes to feel the world and experience all that it has to offer. Starfire's OOC goals are to find and engage in roleplay that develops a fun and vast story. She's not interested in one-shot scenes unless they have some larger goals or can be pieced together to make continuity. Starfire's IC goals are simple; avoid oppression, free slaves, and stop all those that would hurt or enslave others. All Tamaraneans have a physiology that allows them to absorb and store solar radiation of all forms within their bodies. This effectively makes them immune to damage from it, as they will simply absorb it harmlessly. This energy sustains her to a point where it provides her nourishment, gives her superhuman endurance, and even allows her to survive the rigors of space for a prolonged period of time. Due to their physiology, Tamaraneans are capable of flight that leaves an energy contrail behind them when in use. Koriand'r is capable of breaking the sound barrier, flying at about Mach 2 at top speed. The energy Koriand'r constantly absorbs augments her strength as well, of which the upper limits are unknown. While she certainly isn't nearly as strong as someone like Wonder Woman, she can at least press and lift over 20 tons without much difficulty. Koriand'r is able to absorb the knowledge of any language known to a being through physical contact. She can then speak that language with perfect fluency, as if it was natural to her. After being experimented on by a race of beings known as the Psions, Koriand'r is able to channel and project the energy stored in her body into blasts. These blasts are incredibly destructive, easily able to stun an average person instantly with one attack. They are capable of applying enough concussive force to punch through steel, and enough heat to melt it. She can, with time, also unleash a powerful omni-directional explosive blast that has the drawback of almost completely exhausting her, requiring her to recharge before becoming really active again. 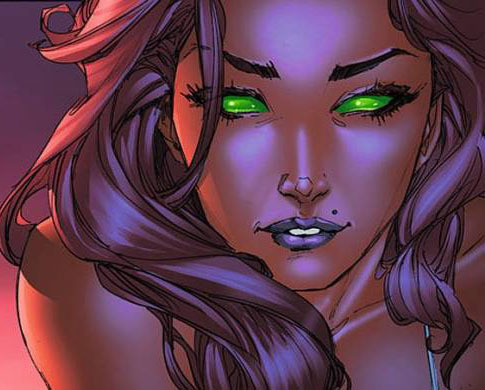 Starfire has a uniquely alien beauty that most humans could find attractive. This allows her to get what she wants with just asking. This is not a power and does not allow her to /control/ others. Kori is the heir to the throne of Tamaran! Known to other tamaraneans as Princess Koriand'r she is the middle child of the royal family and her parents would most certainly want her back. As such if she were able to contact them and re-establish connections with her family, she would then have the backing and help of not only her friends and family from Tamaran but possibly all of tamaran as well. At a very young age Koriand'r has been trained in art of combat by the Warlords of Okaara. She is an expert of hand-to-hand and armed combat. Many of the Tamaranean weapons are similar to Earth's, and so she could more or less use them with just as much skill. Koriand'r is aware of her own beauty, though not so much as to let it go to her head. However, she will use it as a means to an end in the most desperate situations and she is quite good in the art of seduction. Along with combat, Koriand'r has been taught various strategies to use in large battles. Her training is mainly focused on ground warfare. She was taught to exploit weak openings in formations and concentrate the entire assault on those points. The importance of breaking through to reach more vital defenses and swiftly cripple the enemy was greatly stressed over any slow and steady approach. Tamaraneans are not solely focused on combat and warfare. They are also taught to appreciate nature and art. Koriand'r herself is actually quite good at painting, sculpting and crafts. As someone from a race that prides themselves in wearing their emotions on their sleeves, Koriand'r has a hard time /not/ expressing what she is feeling at the moment. The most dangerous emotion would definitely be anger, and when she is made angry she has little to no self control often causing her to act impulsively and it clouds her better judgment. Koriand'r, being introduced to a completely new world like Earth, is quite unaware of how most things work. Socially, she might think things odd that are normal to it's people and vice versa. Human culture is more or less completely foreign to her, and her lack of knowledge could make her susceptible to being taken advantage of. Koriand'r is a very opinionated person, and will often make herself heard either vocally or physically if necessary. This goes even more so when her friends are involved, as she will often stand up for them just as much. While normally this wouldn't be anything bad, she actually will go as far as to oppose authority, /especially/ if it has to do with taking away someone's freedom. Her powers rely on ambient solar energy. If she is not exposed to cosmic rays/solar power for a 24 hour period or she uses her powers excessively without the means to recharge, she will lose her primary abilities of flight, blast, strength, etc. In addition, if there is someone who can drain her powers, she will need to recharge before using them again. A full recharge takes approximately 3 hours in sunlight or 6 in starlight to accomplish. 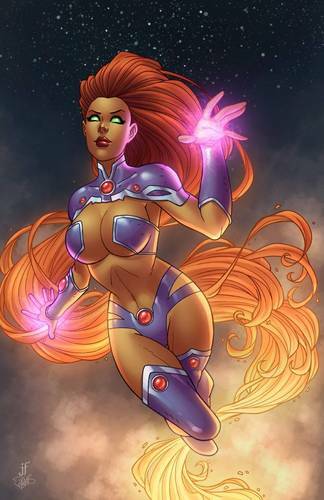 If Starfire is in close proximity to a star or an energy source, she is overloaded with power and unable to discharge it faster than she can absorb it. Her body begins to leak the energy and her emotional states rise uncontrollably. Komand'r is still out there probably..somewhere, and she'd be only too happy to find Koriand'r, capture her and punish her. A tamaranean on the loose with a vengence is a very dangerous thing!